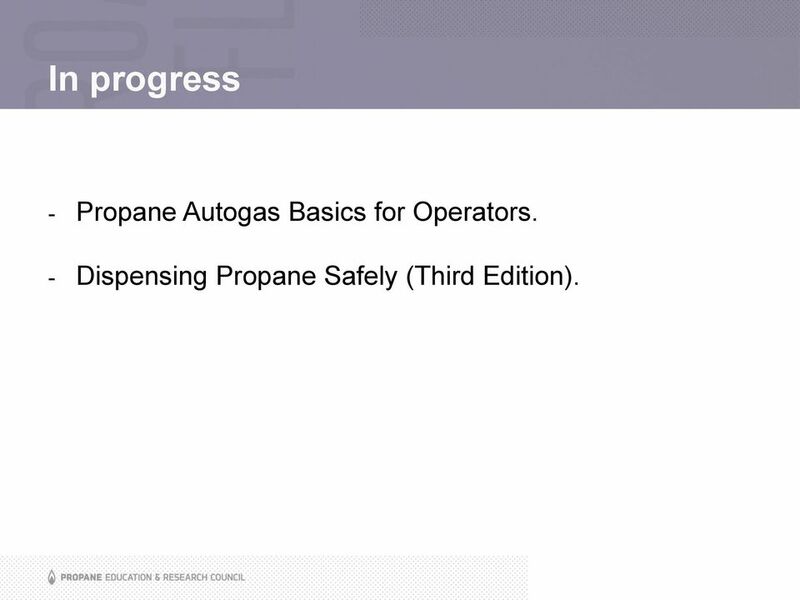 Download "Propane Autogas Fleets Safety & Training"
4 In progress - Propane Autogas Basics for Operators. - Dispensing Propane Safely (Third Edition). 6 Technician certification: Priority No. 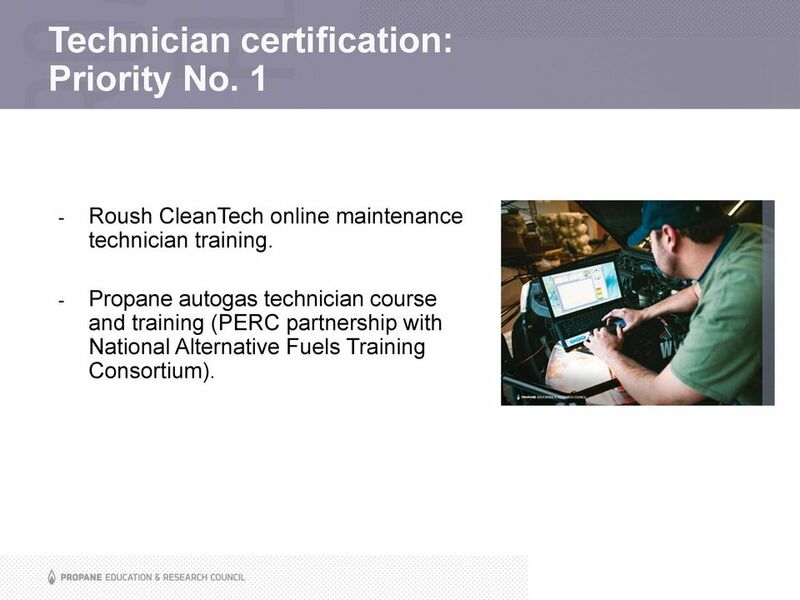 1 - Roush CleanTech online maintenance technician training. 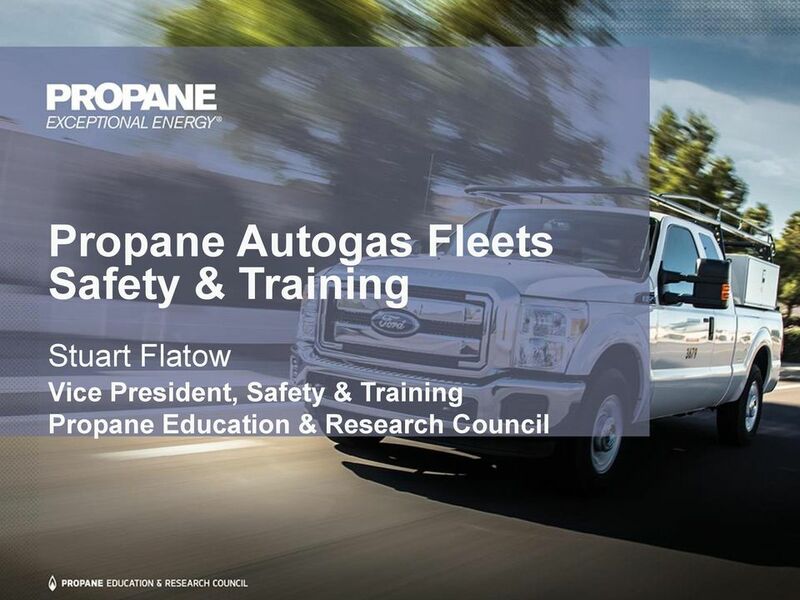 - Propane autogas technician course and training (PERC partnership with National Alternative Fuels Training Consortium). 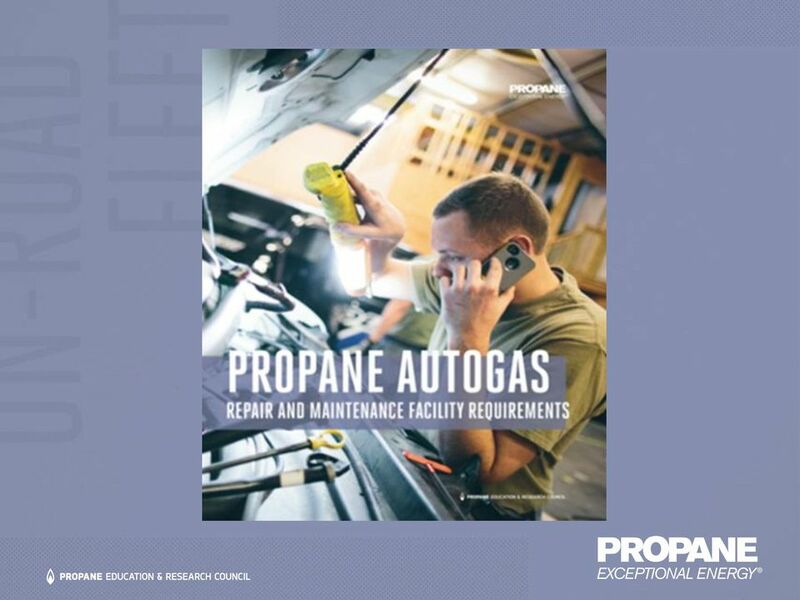 8 Propane autogas garaging, repair & maintenance brochure - Easy-to-understand terms about general design, safety, and codes. 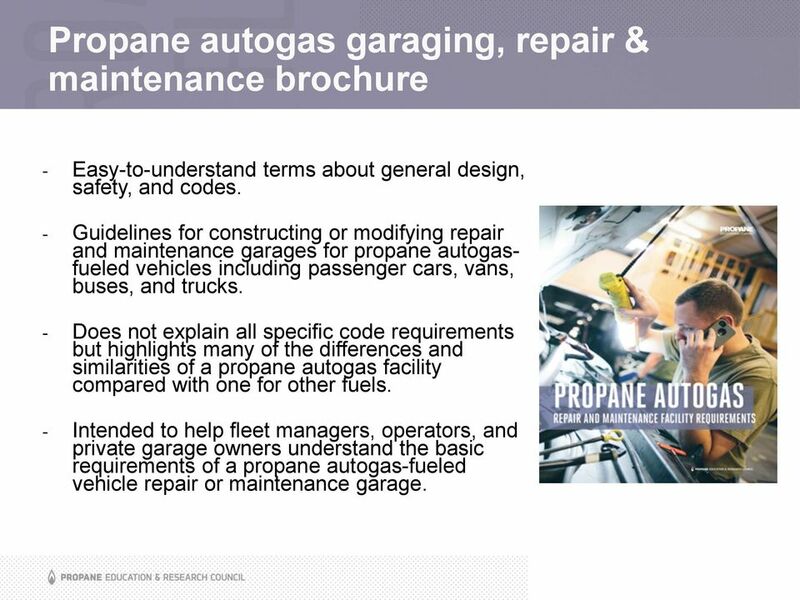 - Guidelines for constructing or modifying repair and maintenance garages for propane autogasfueled vehicles including passenger cars, vans, buses, and trucks. - Does not explain all specific code requirements but highlights many of the differences and similarities of a propane autogas facility compared with one for other fuels. 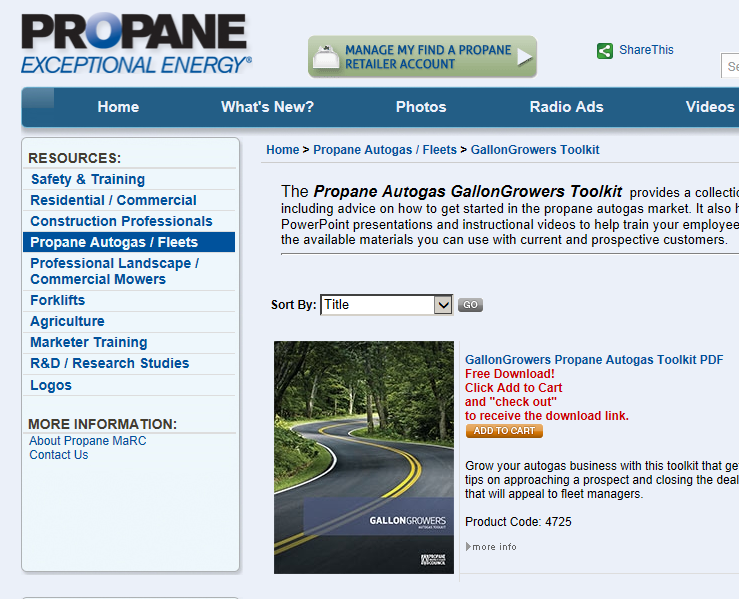 - Intended to help fleet managers, operators, and private garage owners understand the basic requirements of a propane autogas-fueled vehicle repair or maintenance garage. 9 Safety advantages - In its natural state it is nontoxic with no defining natural odor. - An odorant is added to aid in leak detection. - Classified by the EPA as a noncontaminant of air, land, and water resources. - Tanks used for propane autogas are 20 times as puncture-resistant as gasoline tanks and can withstand four times the pressure. 10 Safety advantages (continued) - Requires a much higher temperature to ignite. 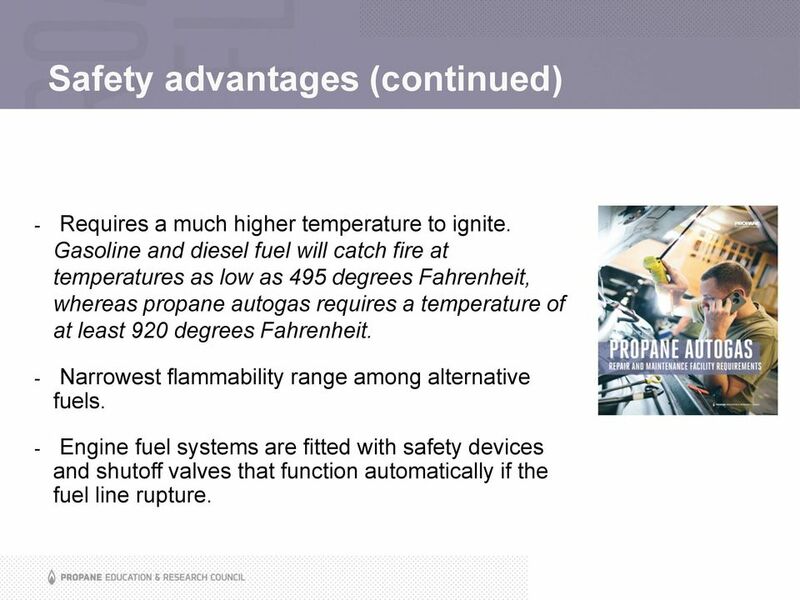 Gasoline and diesel fuel will catch fire at temperatures as low as 495 degrees Fahrenheit, whereas propane autogas requires a temperature of at least 920 degrees Fahrenheit. - Narrowest flammability range among alternative fuels. - Engine fuel systems are fitted with safety devices and shutoff valves that function automatically if the fuel line rupture. 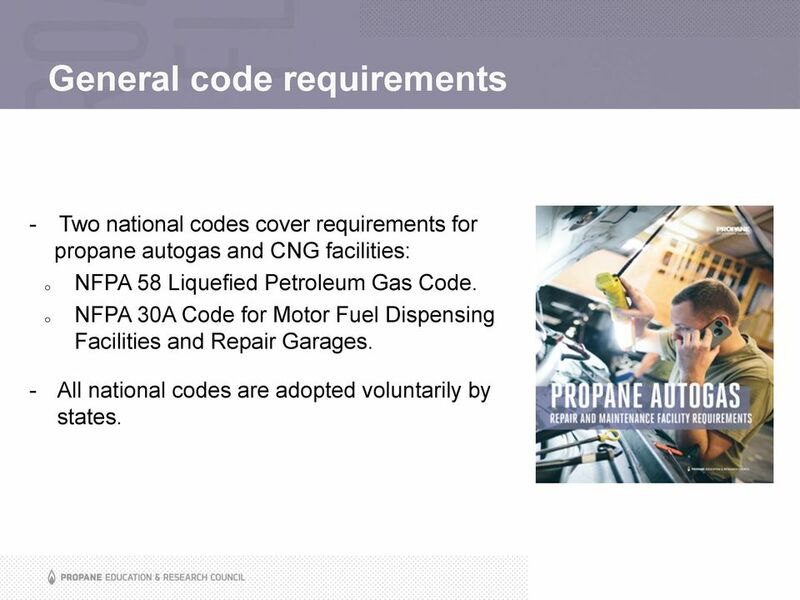 11 General code requirements - Two national codes cover requirements for propane autogas and CNG facilities: o o NFPA 58 Liquefied Petroleum Gas Code. NFPA 30A Code for Motor Fuel Dispensing Facilities and Repair Garages. - All national codes are adopted voluntarily by states. 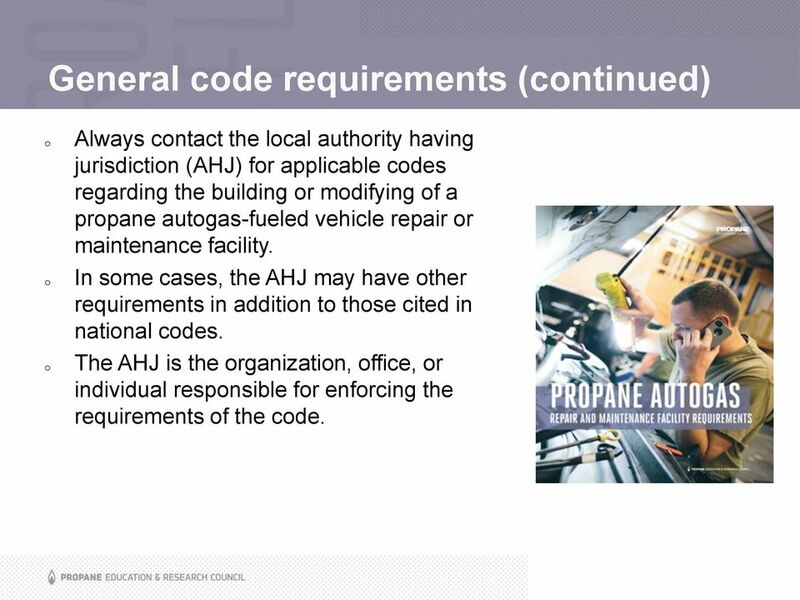 12 General code requirements (continued) o o o Always contact the local authority having jurisdiction (AHJ) for applicable codes regarding the building or modifying of a propane autogas-fueled vehicle repair or maintenance facility. In some cases, the AHJ may have other requirements in addition to those cited in national codes. The AHJ is the organization, office, or individual responsible for enforcing the requirements of the code. 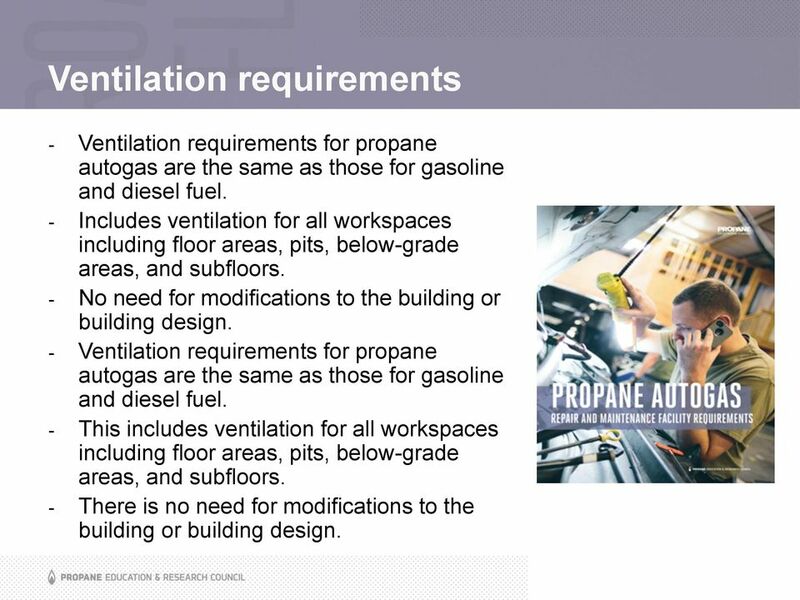 13 Ventilation requirements - Ventilation requirements for propane autogas are the same as those for gasoline and diesel fuel. - Includes ventilation for all workspaces including floor areas, pits, below-grade areas, and subfloors. - No need for modifications to the building or building design. - Ventilation requirements for propane autogas are the same as those for gasoline and diesel fuel. - This includes ventilation for all workspaces including floor areas, pits, below-grade areas, and subfloors. - There is no need for modifications to the building or building design. 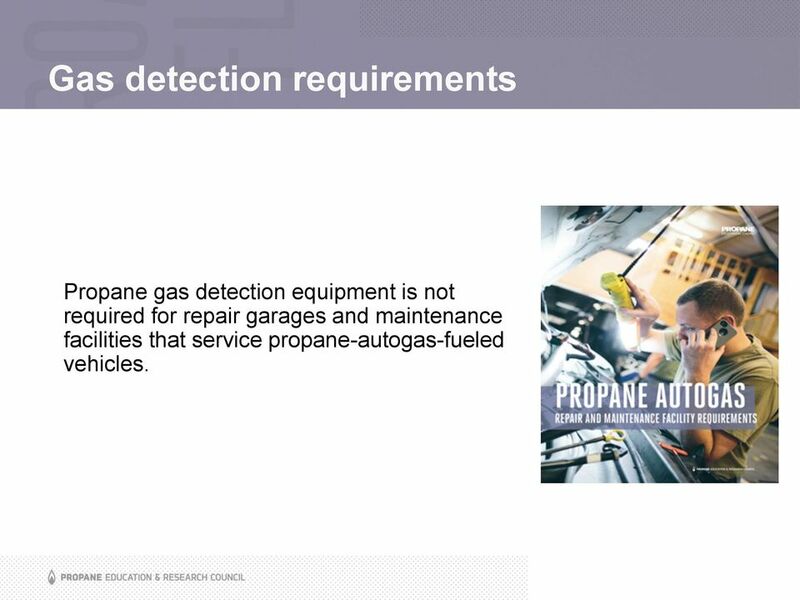 14 Gas detection requirements Propane gas detection equipment is not required for repair garages and maintenance facilities that service propane-autogas-fueled vehicles. 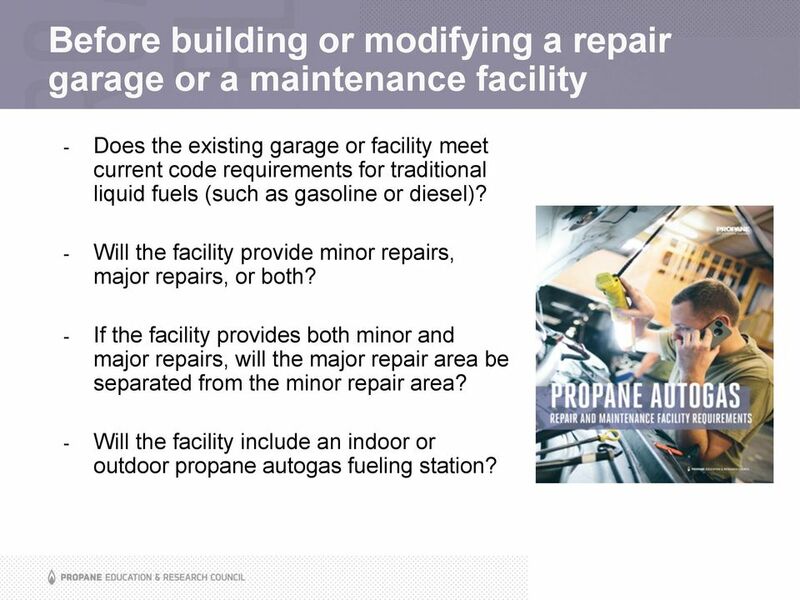 15 Before building or modifying a repair garage or a maintenance facility - Does the existing garage or facility meet current code requirements for traditional liquid fuels (such as gasoline or diesel)? - Will the facility provide minor repairs, major repairs, or both? - If the facility provides both minor and major repairs, will the major repair area be separated from the minor repair area? - Will the facility include an indoor or outdoor propane autogas fueling station? 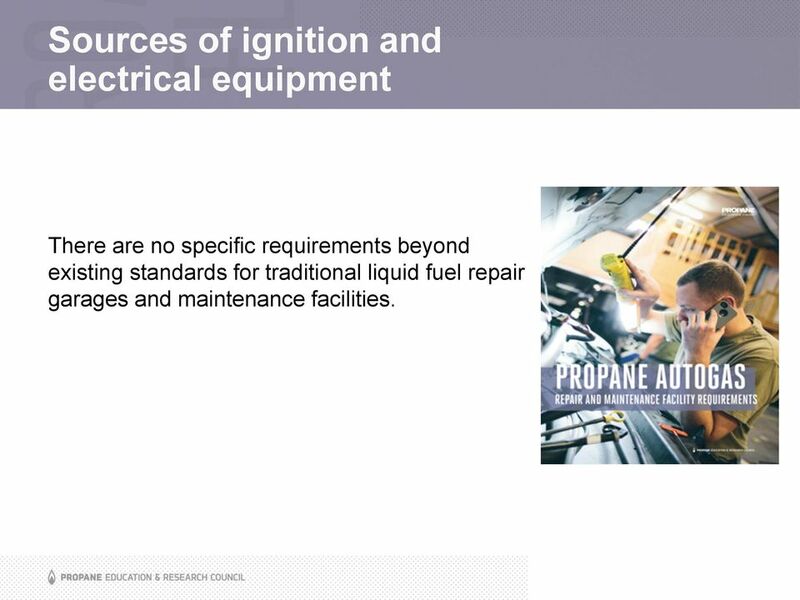 16 Sources of ignition and electrical equipment There are no specific requirements beyond existing standards for traditional liquid fuel repair garages and maintenance facilities. 17 Parking, servicing & vehicle repair requirements - The fuel system must be leak-free. - The fuel tank or container must not be filled beyond the limits specified for the equipment. - The tank or container shut-off valve must be closed when the vehicle or engine is being repaired, except when the engine is required to operate. - The vehicle should not be parked near sources of heat or open flames (or similar sources of ignition), or near inadequately ventilated pits. 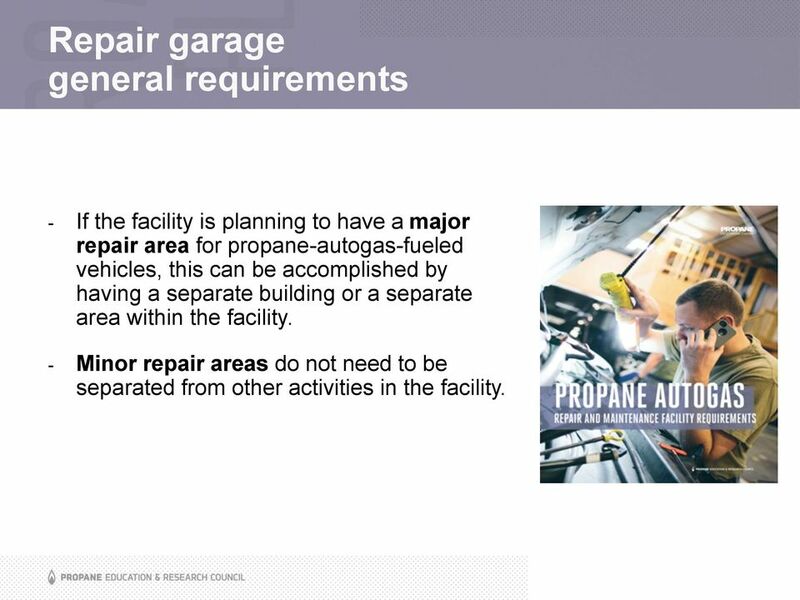 18 Modifications to existing garages or maintenance facilities A review of compliance to existing codes (for liquid fuels such as gasoline or diesel) may be necessary before modifications to allow the servicing or repair of propane-autogas-fueled vehicles can begin. 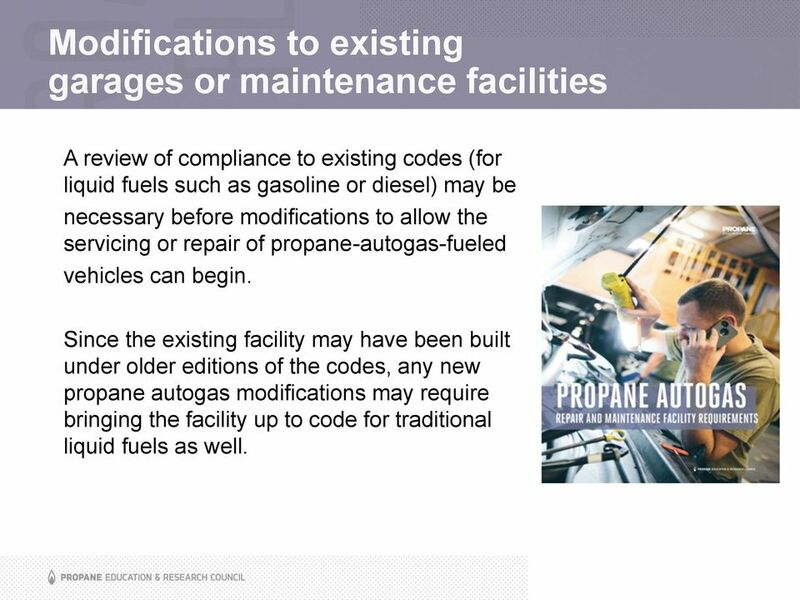 Since the existing facility may have been built under older editions of the codes, any new propane autogas modifications may require bringing the facility up to code for traditional liquid fuels as well. 19 Types of repair garages Each type has specific code requirements. Major Repair Garage: a building or portions of a building where major repairs, such as engine overhauls, painting, body and fender work, and repairs that require draining of the motor vehicle fuel tank, are performed. Minor Repair Garage: a building used for lubrication, inspection, and minor automotive maintenance work, such as engine tune-ups, replacement of parts, fluid changes (oil, antifreeze, transmission fluid, brake fluid, air conditioning refrigerants, etc. ), brake system repairs, tire rotation, and similar routine maintenance work. 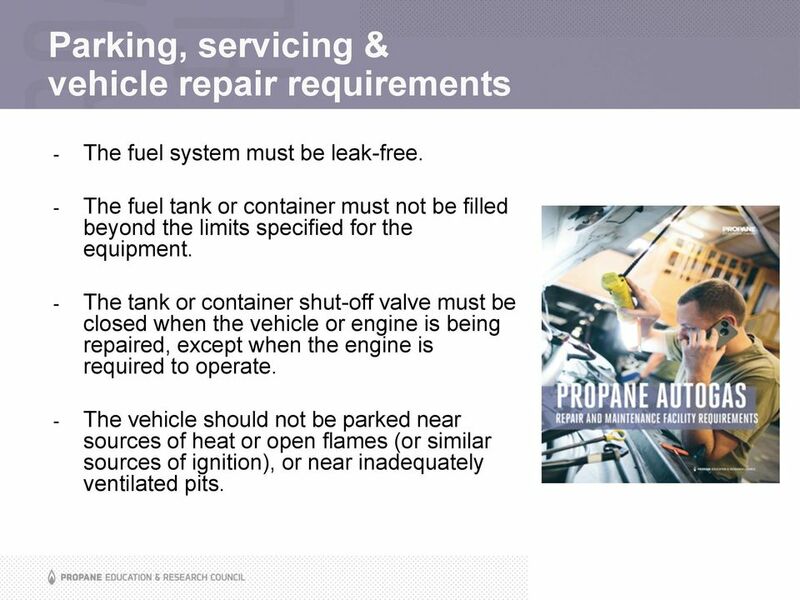 20 Repair garage general requirements - If the facility is planning to have a major repair area for propane-autogas-fueled vehicles, this can be accomplished by having a separate building or a separate area within the facility. - Minor repair areas do not need to be separated from other activities in the facility. 21 Repair garage general requirements (continued) - If part of the facility is being used for major repair activities, there are certain requirements that need to be followed to separate the area from minor repair and other servicing activities. They are the same requirements as those for gasoline and diesel-fuel vehicle major repair areas. - There are no special requirements for propane-autogas-fueled vehicle repair areas. 22 Indoor fuel dispenser stations Indoor refueling of propane vehicles is permitted where the building is constructed in accordance with the requirements of NFPA 30A and NFPA 58, and any other codes that are adopted by the jurisdiction where the building is located. 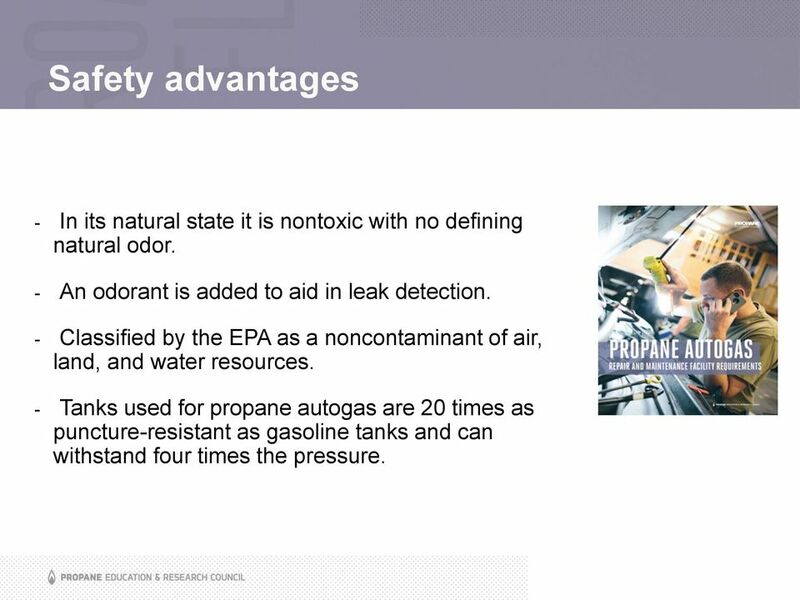 23 Propane autogas storage - Aboveground tanks storing propane autogas must be separated by at least 15 feet from devices that dispense liquid or gaseous motor vehicle fuels. - If the facility has aboveground compressed natural gas (CNG) or liquid natural gas (LNG) tanks, the propane autogas tank must be separated by at least 20 feet. - In addition, the tanks must have physical and security protection in accordance with the codes. - Consult NFPA 30A and NFPA 58 for exact conditions and requirements. 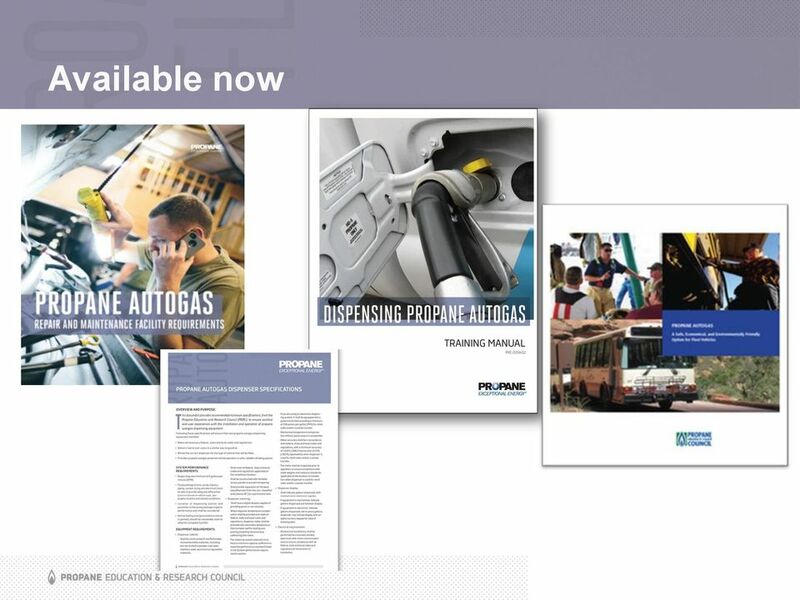 24 Selected online resources autogasusa.com (PERC) Learn about propane-autogas-fueled vehicles and propane-fueled equipment, fueling with propane autogas, adoption incentives, and propane autogas webinars. 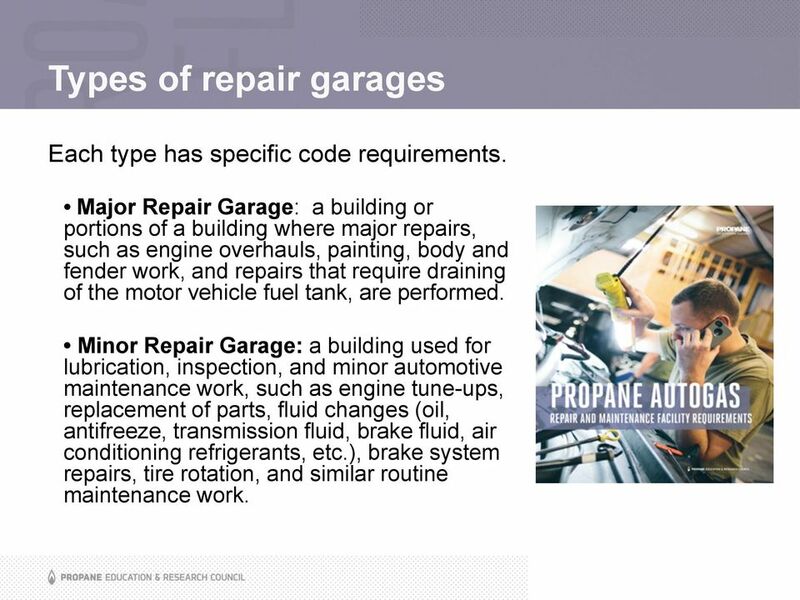 nfpa.org (NFPA) Learn about NFPA codes and standards related to motor fuel repair garages and maintenance facilities, including NFPA 58 and NFPA 30A. 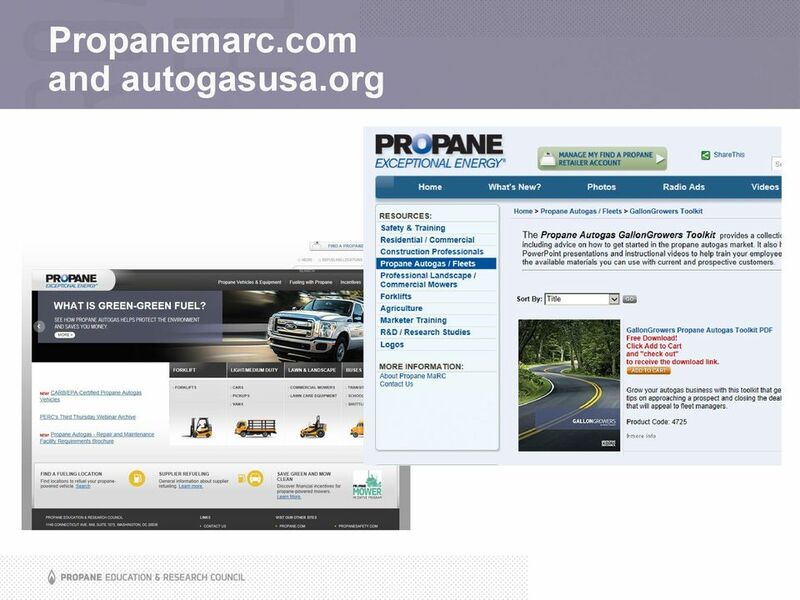 cleanfuelusa.com (CleanFuel USA) Learn about the benefits of using propane autogas, including emission savings and tax incentives, and explore propane-autogas-fueled vehicles. 25 Selected online resources (continued) collinsbus.com (Collins Bus Corp.) Learn about Collins buses, including the Type A Nexbus school bus fueled by propane autogas. 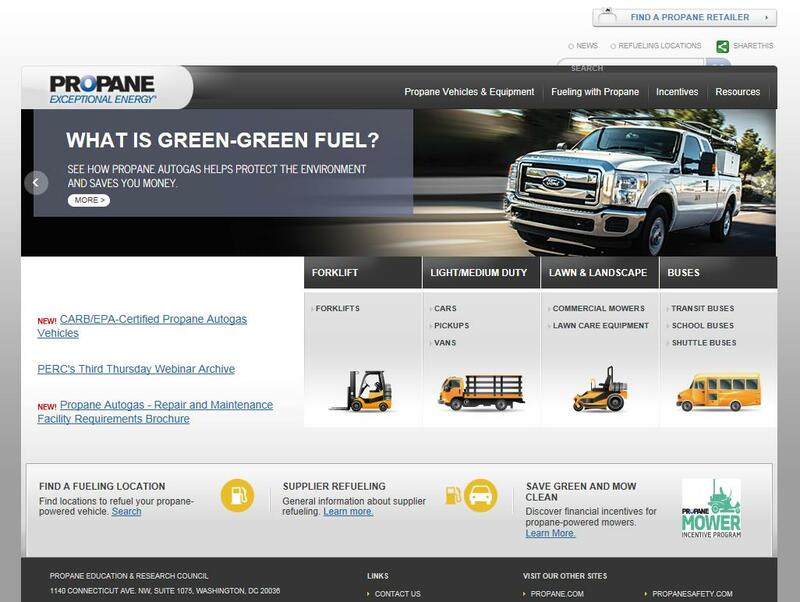 roushcleantech.com (Roush CleanTech) Calculate your emissions savings with propane autogas, view products, and learn why propane autogas is the fuel for progressive companies. blue-bird.com (Blue Bird) Learn about Blue Bird and the affordable green solutions its autogas buses offer. thomasbus.com (Thomas Built Buses) Learn about full line of school, child-care, activity, green, and specialty buses, including a Type A bus that runs on propane autogas. EFFECT. DATE: 01/13/1991 SERIES PURPOSE: The purpose of the automotive mechanic occupation is to repair & maintain cars, trucks & equipment. The Federal Railroad Administration (FRA) was created by the Department of Transportation Act of 1966. It is one of ten agencies within the U.S. Department of Transportation concerned with intermodal transportation.